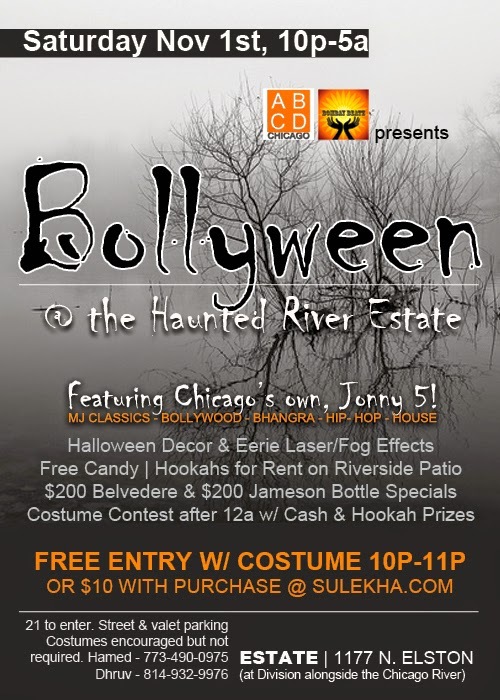 ABCDchicago: Bollyween @ the Haunted River Estate! Bollyween @ the Haunted River Estate! Join us for our annual Halloween bash! We're back at Estate where Jonny 5 will light up the dance floor with Michael Jackson classics, Bollywood, Bhangra, Hip-Hop, and House all night! There will be Free Candy at the Bar and the venue will be covered in webs and filled with Fog and Laser Lighting to create an eerie vibe. The Costume Contest will commence after 12a with cash & hookah prizes! Weather-permitting, guests can also indulge in Outdoor Hookah Service alongside the River. Hookahs are $30 which includes a complimentary refill. Early arrival strongly encouraged. Capacity crowd expected. For bottle service or event inquires, call Hamed at 773-490-0975 or Dhruv at 814-932-9976. Costumes strongly encouraged but not required. This event is 21+ to enter. Valet parking available for $10 per car. Enjoy these pictures:Diwali Dhamaka 2014!